I discovered Barbara Pym several years ago but have not even nearly got all of her books read. Pym was very popular in the 1950s and ’60s but somehow she went out of style at some point until the mid 1970s during which time publishers wanted more “stylish” material. Then in the 1990s she was re-discovered when a column highlighting her as one of the most under-rated authors of the 20th century appeared in the London Times Literary Supplement. The publishers then started accepting her work again. In addition to A Glass of Blessings, I’ve read Excellent Women (1952) and Quartet in Autumn (1977). 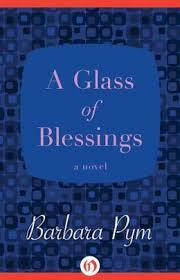 A Glass of Blessings is about Wilmet Forsyte, an upper middle class married but childless, 33-year old homemaker and her relationships with the people in her community parish. She’s married to Rodney Forsyte, a government employee, and she really doesn’t do much except socialize and gossip. This is really a very gentle and loving satire of 1950s parish life and the women who made up the central congregants. Sometimes the The Anglican fathers and their assistants have their problems, the women have their little concerns about the altar flowers and the fashionable colors, but most of the non-parish men in their lives seem rather tangential. Except of course for the man Wilmet seems to have her eye on. Who gave her that precious little box for Christmas? The one with the ambiguous poem in it? Was it Piers? Or what is Mary Beamish going to do now that her mother has passed away and she has her freedom as well as the money to enjoy it? Will she travel and find romance? Hmmmm….. (LOL!) Sylvia is a hoot – she is Wilmet’s mother-in-law who lives with them. This is a wonderfully well written book with a fairly straightforward linear structure and appropriate metaphors. The characters are well developed except that the Fathers were hard to distinguish at first, also, the geography was a bit difficult – how far away from each other were these places, the homes and parish houses, the main church, the ministry (government), the retreat, the convent. The beauty of the book for me was remembering the church of my childhood and how the ministers were like next to God and the women all flocked around them. I know that Pym is one the gaps in my reading so I’m very glad that one of our reading group members has chosen ‘Jane and Prudence’ for her next book. Have you read that? Am I going to enjoy it? I love Pym but I have no idea if you’ll like Jane and Prudence – that’s one of the ones I still want to read. I think Quartet in Autumn was her best and A Glass of Blessings second, but that’s considering my limited exposure! Let us know on your blog what you and your group think.